We eat a ton of yogurt in our house. My kids favorite has M&M’s or Oreo’s that are in the lid and can be sprinkled over the top. I’m not convinced that’s the best breakfast for them in the morning! And they are expensive! Those little cups of yogurt masquerading as dessert cost over $4! 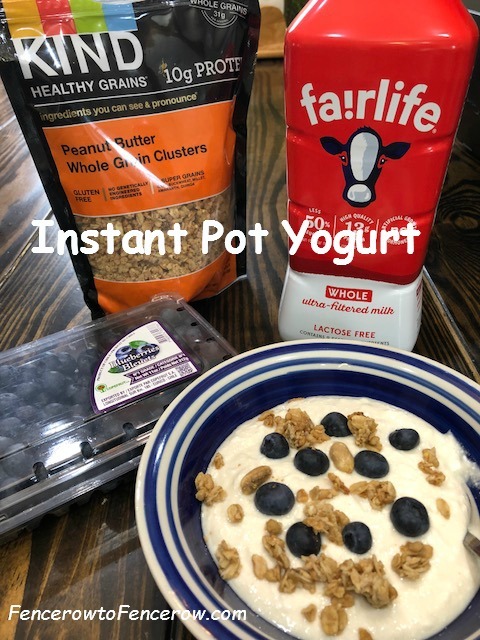 As the proud owner of an Instant Pot and having seen a ton of yogurt recipes, I decided it was time to give yogurt a try! 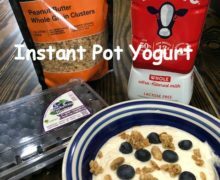 There doesn’t seem to be a ton of ways to make yogurt in a pressure cooker or Instant Pot. I drew inspiration from This Old Gal’s recipe. She seems to have alot of options! I started with Fairlife milk. Have you tried their milk? If not, you should buy some! Their chocolate milk is fantastic! Fairlife is made from cows at Fair Oaks Farms in Northwest Indiana. This agritourism destination is a favorite of my family and a personal interest of mine. Fair Oaks has a dairy adventure, where guests can tour a real working dairy farm. We love watching the cows be milked! But I’m also really excited about the Fair Oaks Pig Adventure! I serve on the Board of Directors for the Pig Adventure and love to encourage people to visit and see baby pigs, learn about pig health, and even give a pig an ultrasound! (It’s a plastic pig, but it’s still fun to learn about pig pregnancies!) Visitors get a chance to visit a working pig farm, and leave without ever getting their shoes dirty! Every yogurt recipe I read called for ultra pasturized milk. What does ultra pasturized mean? Ultra Pasteurization (UP), or Ultra High Temperature (UHT) pasteurization, is the process of heating milk to approximately 280 °F for just 2 seconds and then chilling it back down rapidly. This gives it a longer shelf life! 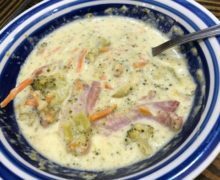 I used Fairlife Ultra Pasturized Whole Milk for this recipe. A half-gallon was $3.99. I also needed a yogurt with active cultures. I bought a 5 ounce container of plain Chobani yogurt and used half of it. That only cost me $1! My yogurt only cost me $5! The process was simple. Put the half-gallon of milk in the Instant Pot pan. Add a few tablespoons (or in my case, a couple of spoonfuls) of the yogurt and whisk. 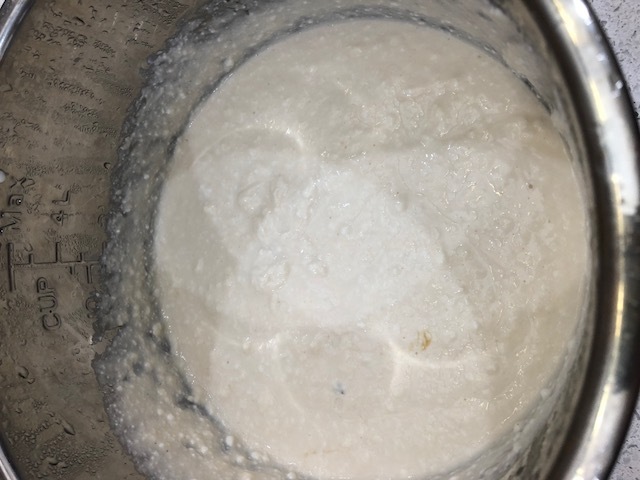 Set the Instant Pot to Yogurt, making sure your valve is closed, and cook for 8 hours! That’s it! The pot doesn’t come up to pressure. So the lid can be removed at any time. The longer you cook the yogurt, the tangier it gets. You could cook it for 10 hours and have a tangy yogurt. I opted for 8 hours so it would have a bit less tang. After 8 hours, put in the fridge and let cool for at least 4 hours. And then doctor it up however you want! I added vanilla and honey to sweeten my yogurt a bit. The kids love to eat yogurt with fruit and granola. I love Kind granola. I don’t care that they promote organic ingredients. That’s not important to me. I just love the taste and the price! A half gallon of milk makes a lot of yogurt! I will have at least 16 1/2 cup servings of yogurt from this recipe. I estimate I will save at least $8 by making my own. The kids can add their own toppings. I may even take some of my savings and let them add a few M&M’s. A super simple, cost effective way to make your own yogurt! 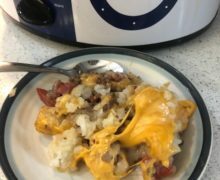 Add milk and yogurt to Instant Pot. Whisk together and put lid on. Push the yogurt button and use the +/- buttons and set time to 8 hours. The Instant Pot will start at 0 and count up to 8 hours. When Yogurt cycle is finished, remove cooking pot and transfer to refrigerator to chill for at least 4 hours. You are inspiring me! I just unboxed mine (that I have had IN the box for a…gsap…year! ), and as soon as my counters are in this coming week, I am hoping to remember how to cook. My oven will be in probably around March 5, and then I get to remember how to bake!